What Happened On Internet Every Minute In 2014? The internet is becoming an integral part of our lives. It is to us what perhaps the newspaper was to our parents, or the radio was to our grandparents. 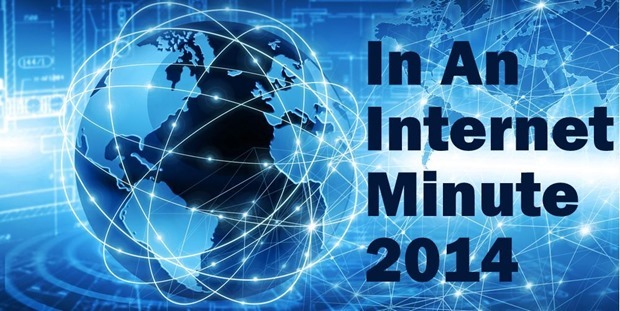 Nearly 40% of the world’s population now has access to the internet and with the number going up by leaps and bounds every year, nearly half of the world’s population will be connected to the internet by 2018 according to eMarketer. During the last year, 316 million new users got connected to the internet, their number having gone up from 2,712,239,300 to 3,028,523,000. More than two out of every five people (40%) on this planet now have an internet connection, whether they access it using their smartphones or their computers and tablets. And what does this enormously huge number of people do over the internet, one might want to know? Video content is becoming increasingly important- and that has not gone unnoticed by leading brand owners and content marketers. Everyone who wants to be seen or noticed online or over the social media has now become a content creator and curator in his/her own right- with the number speaking for themselves, do we need more proof? Content is the king, goes the cliché but the manner in which this content will be dished out to surfers over the internet has undergone a sea change. Pictures and video content is becoming more popular and thus getting preferred by marketers and publishers. The increase in the number of Apple apps being downloaded every minute also points to the increasing adoption of smartphones across the world. I personally would have wanted to know how much the data consumed by an average internet user has changed over the last year. You can check the full infographic published by TechSpartan here. What, according to you, is the most noticeable change and what has taken you by surprise? Now, Google Search Offers Full-Fledged Flight Search. Will Severely Affect OTAs! Yu Yureka Sale Was A Cruel Joke Played On Consumers!